Our new First Holy Communion ornaments are lovely religious favors representing the generous gifts given to us as children of the Father. What a lovely remembrance for many Christian occasions such as confirmation, baptism or a priest or pastor retirement gift. 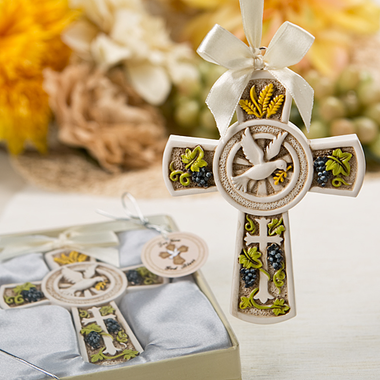 A gracious dove takes flight from the center of the unique cross ornament, which is made of polyresin for durability. Created in an ivory tone with colorful hand painted details of grapevines and wheat. Each ornament is 3 3/8" x 4.5" and comes in an ivory gift box with see through top and rests in a bed of silver satin. Each box is finished with a silver bow and a general use "For You" tag comes attached.